Experience luxury and breathtaking scenery in one of the most picturesque locations on the Cote D'Azur. Stay in a unique 3-bedroom penthouse that features one of a kind views of the Riviera. With 3 bedrooms and en suite bathrooms, the apartment can comfortably accommodate up to 6 guests and has a large fully equipped eat in kitchen and separate dining area for entertaining. Large panoramic sliding glass doors in all rooms provide an unobstructed view of the Mediterranean sea, providing the perfect atmosphere to a modern living space. Full length terraces to the front and rear of the apartment provide picture-perfect view of the unique scenery that surrounds the apartment – the clear blue skies, views of the snow covered Alps in winter, the subtle shadows of the Esterel mountains and nearby islands, and of course, the calm and spectacular blue waters of the local bays. 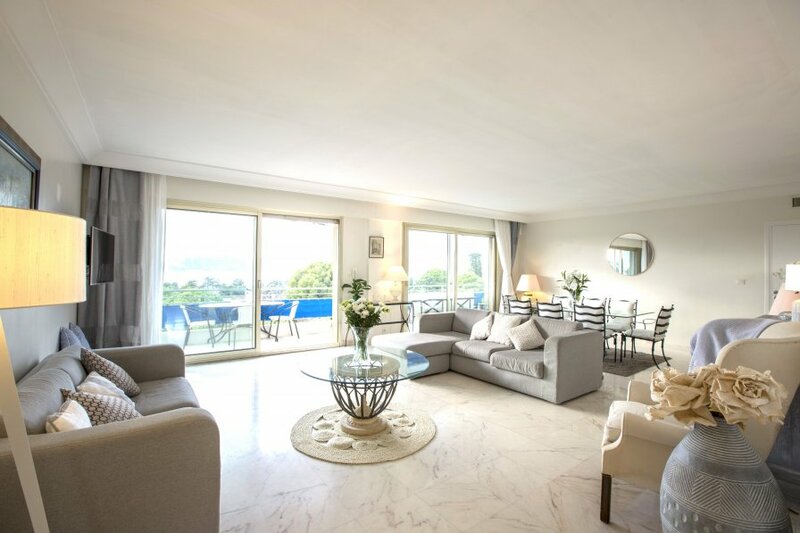 Your penthouse provides an impeccable blend of modernity and convenience with a touch of traditional French style. Upon arrival, guests are welcomed by a large open-air living area on the upper floor of a private apartment block level facing the ocean toward Cannes and St Tropez, where plushy sofas are the perfect spot to relax after your journey. The apartment is fully air conditioned with high speed broadband, satellite TV and landline. Cap D'Antibes is located between the towns of Juan Les Pins and Antibes and within walking distance to local private and public beaches.